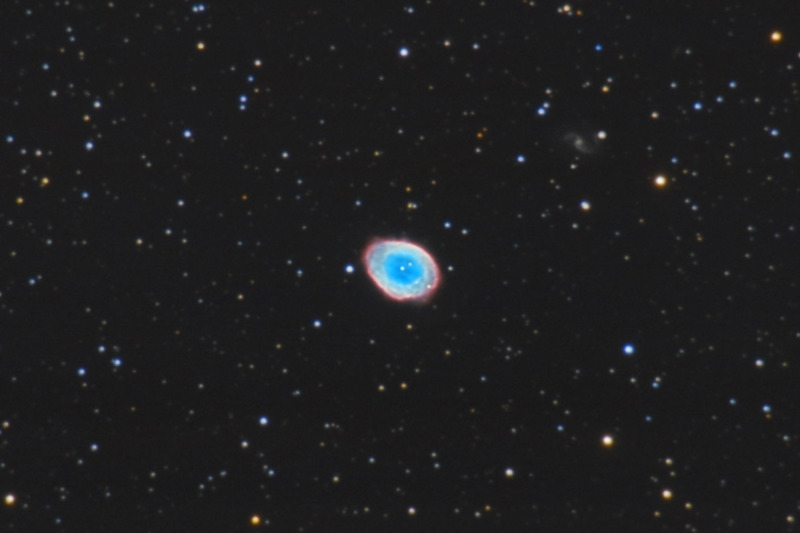 M57 is the prototypical planetary nebula. Planetary nebulae are shells of gas that are being blown off from the central star as it transforms from its giant phase into a white dwarf. The planetary nebula phase represents one of the last stages of a star's life. The Ring Nebula is about 2 light years in diameter. That means that if the central star were at the location of our Sun, the nebula would extend halfway to our nearest neighbor - Proxima Centauri. This image also shows a background spiral galaxy, IC 1296. Software Used Images Plus 4.0 for camera control, calibration, and stacking. Images Plus 4.5 for digital development, smoothing and noise reduction, Richardson-Lucy restoration, and multiresolution sharpening. Photoshop CS5 used for levels and curves, color correction, selective color, high pass filter, star shrinking, lab color, saturation adjustments, match color, screen mask invert, and lens correction. Gradient Xterminator for gradient removal. Carboni Tools for additional saturation adjustments, noise reduction, and smoothing. HLVG for additional color correction. Notes This was an interesting object to photograph, as it is much different than most objects. The Ring is quite bright, so it is a bit tricky to not overexpose the image. At the same time, I was trying to capture the faint galaxy IC 1296. While the image is overall pretty good, in retrospect, I probably should have tried a combination of exposure times.